This data from the May 2014 census of DOAJ journals identified as using the open access article processing fee method may be of interest. In brief: the majority (68%) of fully gold OA journals in this sample charge less than $1,000 USD. Only about 1% charge more than $3,000. 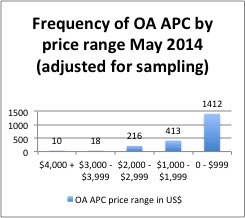 Of the minority of journals included in DOAJ at that time identified as using the OA APC approach (approximately 26% of journals in DOAJ) which were confirmed through sampling to be using APCs, a majority of journals charge less than $1,000 USD. 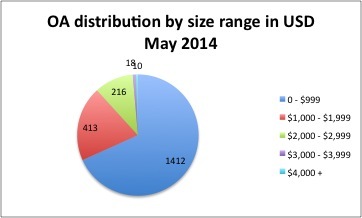 As these charts illustrate, 68% of journals sampled (adjusted for sampling factor, e.g. if one out of five titles by a publisher or in a particular publisher size range was sampled, the results were multiplied by 5) had APCs in the 0 – $999 USD range. Only 1 journal (10 adjusted for sampling factor) was over $4,000. Only 5 journals (18 adjusted for sampling) were over $3,000. That’s a combined total of less than 1% of the total in this price range.